There are 3 reviews for 'Asdivine Hearts'. 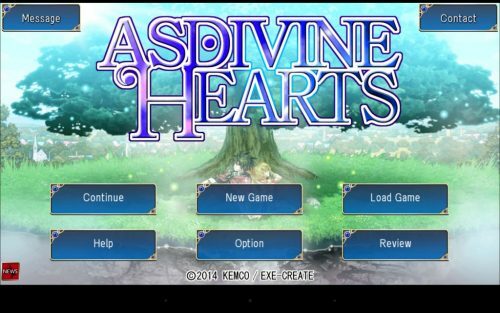 Asdivine Hearts is one of the best, most polished games Kemco has released. The characters are likeable and well written, and the story is pretty decent. Translation seems a bit better than other releases. Gameplay is fun– battles are well animated and they had a pretty good character/creature designer for this title. Skills are equipped in a tetris like board, which isnt my favorite but it works. All in all highly recommended! An animal party member that isn't annoying as all hell. The story is a bit weak (later parts of the game), but I love the characters. And the whole customization isn’t as annoying nor overpowered as later Asdivine games. This game is purchase only (no freemium version), because there’s not as much gem-grinding as those later games. Quite good. I like the idea that characters have their own specialized elements. And you can later learn other elements (with customization blocks), which allows you to learn combined-element. I guess if you somehow learn all elements, you are going to have ridiculously overpowered combined-magic. But even that won’t be enough to beat the secret boss if you don’t think things through. Very nice. If you somehow learn all elements, the game balance breaks. Good luck with that, though. Jewel Recommendations for Late Game? A Brief Guide To Game Mechanics. Asdivine Hearts is Truly Amazing – Ten out of Ten!